WAS THERE EVER A REAL CASTLE IN CALNE? 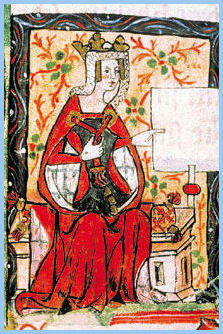 History tells us that Maud, also known as Matilda of England (Granddaughter of William the Conquerer) stayed at a castle in Calne on her way from Arundel to Bristol in 1139. 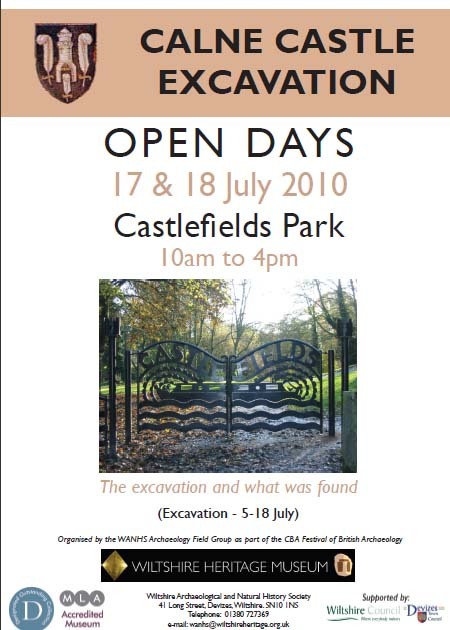 Local area and street names (Castle House, Castle Walk and Castlefields ect) also indicate that there was once a castle here. However, Until now, no physical evidence has yet been found. Was there a castle in Calne? Yes, there was. Not a particularly large one. But a fortified tower house probably with a crenelated tower that would have stood, judging from the base, about 40 feet high. 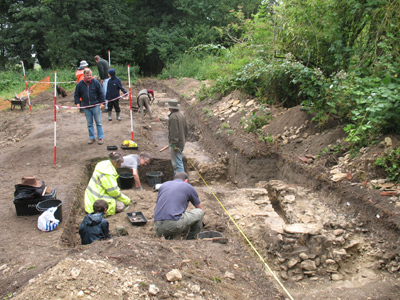 The excavation has established conclusively that an important 13th or 14th century building once graced this promontory overlooking what is now the town of Calne. The excavation of the site started with a geophysical survey including resistivity, magnetometry and ground penetrating radar. The readings from these surveys indicated clearly that there was significant disturbance under the top soil to warrant mounting an excavation and that one of the features was a large circle. 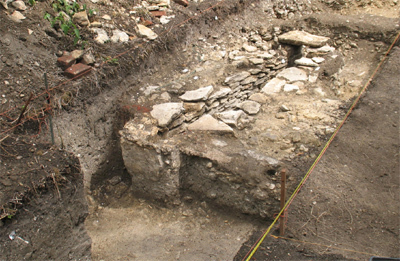 The site owner, Wiltshire Council, licenced the dig for a two-week period and work began by mechanically removing four or so inches of top soil. Within a few more inches the tops of the walls and evidence of some interesting internal features began to appear.  From the very beginning a staggering number of pieces of pottery and tile began to be collected. By the end of the dig over 10,000 finds had been amassed, covering more than 1,700 years. There were one or two worked flints, but the site can definitely be said to have been in use by the Iron Age and the Romano-British period. In the last two days of excavation two parallel Roman walls were uncovered together with datable Roman pottery. Alongside one of the walls was a beam slot where a suspended wooden floor would have been affixed. Another important discovery within the last few days of the dig was a well within one wall. 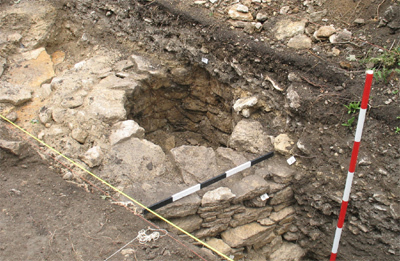 It has not been possible to excavate more than 1.5 metres down but clearly the walls of the well are lined with carefully cut and shaped stone. 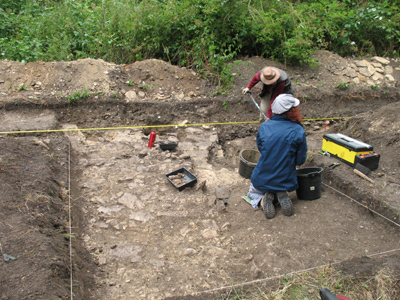 Although being more successful that could have been hoped, the two-weeks allowed have been too little to have a complete understanding of the site. So far it has been discovered that the type of building likely to have been here was a crenelated semi-fortified tower house such as was built for Robert Burnell at Acton Burnell, Shropshire. 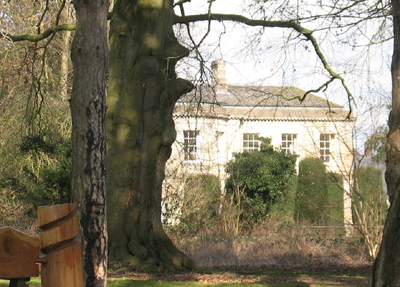 During the reign of Queen Elizabeth 1st, Elizabeth Burnell is recorded as living in ‘The Castle’ on land in Calne granted to Fulk de Canelo by the king, early in the 13th century. However, much more research into the complicated world of Medieval family relationships will be needed to confirm the suspected link between the Calne ‘castle’ and the families of la Zouche, de Canelo and Burnell. 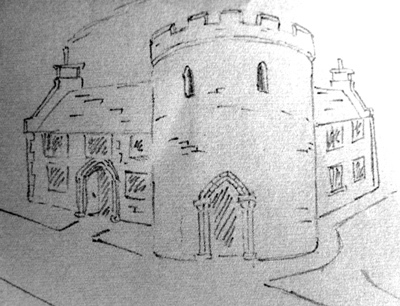 Left is a team members sketch to illustrate what the ‘castle' may have looked like in the 17th centuary, prior to demolition.